Happy Friday and thanks for closing anohter wonderful week with #ThatBusinessShow with your Guest Host, Topher Morrison! We also were lucky to have in our lovely Co-Host Stella Guidicelli! As this week comes to a close, our Guest Host Topher Morrison is leaving, as on Monday we will be joined once more by our Host, Jamie Meloni! We had a wonderful week here on #ThatBusinessShow, full of laughter and great guests! You can checkout our weekly photo recap posted here soon! But, as for today, we had a great guest lineup! 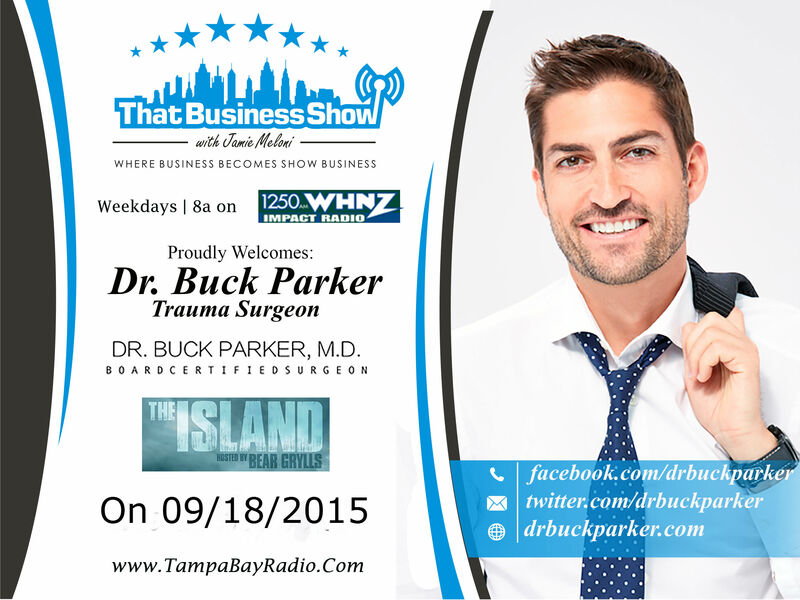 Our first guest was Dr. Buck Parker, a trauma surgeon who also specializes in expert medical opinions on the Web, radio & TV programs nationwide. 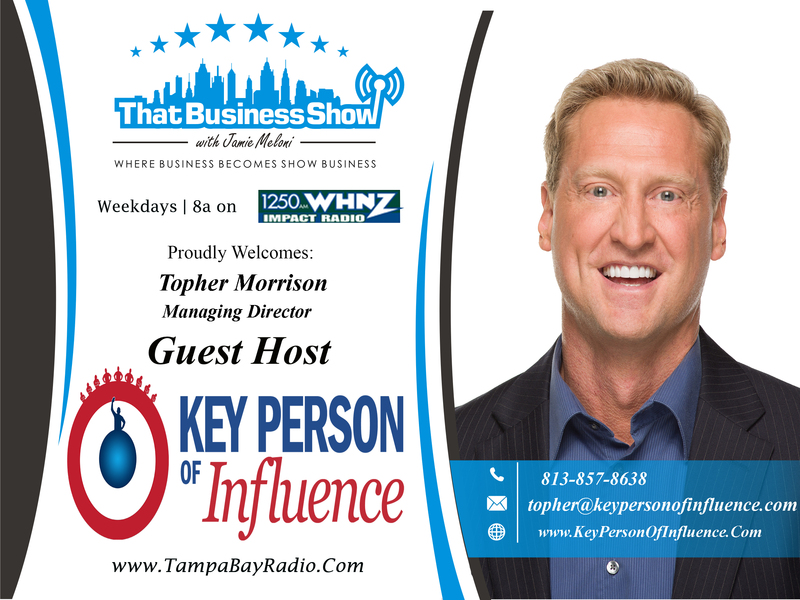 Next here on #ThatBusinessShow here wth Topher Morrison was Katie Krimitsos, Co-Owner and Chief Operating Officer of the Tampa Bay Business Owners! 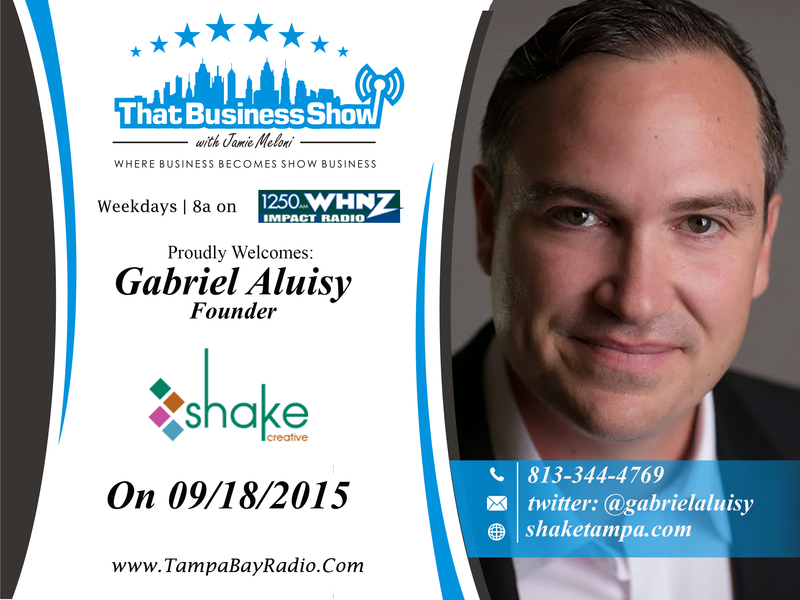 Our last guest here with Topher was Gabriel Aluisy, founder of Shake Creative, a Tampa based branding and design agency focused on helping country clubs and luxury lifestyle brands build revenue & connect with consumers. Remember that you can catch #ThatBusinessShow with Jamie Meloni every weekday at 8am on #1250WHNZ! Joining us first was Dr. Buck Parker, a trauma surgeon who also specializes in expert medical opinions on the Web, radio & TV programs nationwide. You may know him from the hit NBC TV show, ‘”The Island” with Bear Grylls. He spoke to Topher and Stella about his frustration that he studied for 15 years but is more recognized for his television debut, which they all had a laugh about. They discussed how his TV appearance has changed his life, being treated differently and how he is better now at communicating with his patients. Buck prides himself on being able to help his patients better understand the information they need to in regards to medicine and new and upcoming changes in the medical field. He has been many times on TV and Radio, and now joined us on #1250WHNZ with #ThatBusinessShow with Guest Host Topher Morrison and Co-Host Stella Guidicelli! If you missed out on this episode, head to http://www.tampabayradio.com to hear any episode on demand! Learn more about Dr. Buck Parker at http://www.drbuckparker.com and follow him on twitter at @drbuckparker! Next on #ThatBusinessShow our Guest Hosts Topher Morrison and Stella Guidicelli welcomed Katie Krimitsos, Co-Owner and Chief Operating Officer of the Tampa Bay Business Owners! TBBO is a very special community of business owners who come together to provide support, education and connections for one another. Katie and her husband pride themselves on hosting the elite group of Tampa business owners and providing them with a great network to share business and share connections that foster growth! She’s a passionate writer and absolutely loves the power of words – especially their ability to connect others in authentic moments that provide the platform for transformation and connection. She discussed with Topher how The TBBO is very selective on who they welcome, and what kinds of people they welcome into the group. She also hosts Biz Women Rock, a very successful Podcast! So check out Katie Krimitsos at http://www.tampabaybusinessowners.org, and hear Biz Women Rock at http://bizwomenrock.com/! Our last guest here on #ThatBusinessShow with Guest Hosts Topher Morrison and Stella Guidicelli was Gabriel Aluisy, founder of Shake Creative, a Tampa based branding and design agency focused on helping country clubs and luxury lifestyle brands build revenue & connect with consumers.Gabriel and Topher discussed how social media improves your business when done right, and how some people can use applications like Periscope and Meerkat to vastly increase their social following! He is the author of the bestselling book, “Moving Targets: Creating Engaging Brands in an On-Demand World”. If you didn’t catch the great tech discussion with Gabriel and Topher with some great social media tips, head over to http://www.tampabayradio.com!